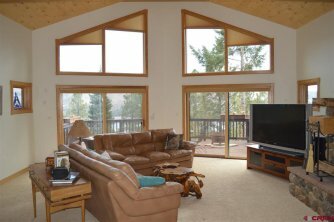 This single-family home, located at 893 Lake View Drive in Bayfield, CO, is currently for sale. Listed by Kyle McAfee and Madeline McCarty of Highland Realty, the home features four beds, four baths, and an approximate 3,680 square feet of space for $670,000 ($182/sq ft). The home sits on a 1.48 acre lot with a 81122 ZIP code and was built in 2001. 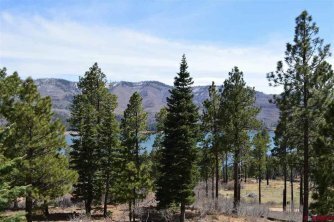 This 1.1 acre lot is a beautiful wooded parcel with expansive views of Vallecito Lake and would be a perfect lot to build your new dream home. The gentle contours on this lot offer several locations to site the home. There is underground electric and phone service to the lot; sewer would be a septic system to be installed by the buyer and there is access to a central well system thru Warlick water company; gas service would be propane. The lot is currently being offered alone for $98,000 OR may be purchased as an Add-on lot to the home next door (893 Lake View Drive) that is currently for sale, MLS #743796 for a discounted price of $65,000 if purchased with the 893 Lake View Drive home. Come check it out today! Only a 25 minute drive to Bayfield and a 40 minute drive to Durango, this home has recreational and practical family-fun potential. Vallecito Lake is a secluded mountain valley 8,000 feet above sea level and is one of the largest and most beautiful bodies of water in Colorado. Bayfield is a beautiful small town located in Southwest Colorado with a growing population. Since 2000, the Town has developed a special improvement district and developed a business park with 38 commercial parcels on 56 acres. Today, it’s home to a number of substantial businesses and organizations. Residents of Vallecito Lake are part of the Bayfield School District and enjoy access to some of the most pristine wilderness in the lower-48 states. With classic “Colorado” winters as well as warm, languid, lake-side summers--and everything in-between! The lake is open yearly for recreation, including boating, paddle boarding, fishing, and much more. There is ample access to endless miles of trail to hike, bike, and explore in and around town. Madeline was born and raised in Vallecito and has built a lifelong relationship with the people and areas that make the community so rich. She has been a Colorado licensed real estate broker since 2016 and has served as Highland Realty’s licensed notary since 2017. Besides working for Highland Realty, Madeline has been a contributing member of the Vallecito Lake Service League since 2008. For more information Madeline can be reached at (970)-759-3725 or madeline@highlandrealtyco.com.